In March 2015, AfriForum, a South African civil-right organization, found E. coli in the drinking water of four local South Africa municipalities: Molteno-Inkwanca, Tarkastad-Tsolwana, Coligny-Ditsobotla and Vryheid-Abaqulusi. Under the South African National Standard for Drinking Water (SANS 241:2011) and the World Health Organization (WHO) guidelines, E. coli must not be detected (count per 100 ml) in any drinking water samples. Local communities were notified not to drink the water. The non-compliance municipalities’ water authority was told to investigate the source of contamination and implement corrective actions. Follow-up samples were taken and tested clean. E. coli is found in the intestines of human and animal. While most E. coli strains are harmless, some are pathogenic and can cause severe human illnesses. According to the study undertaken by WHO’s Foodborne Disease Burden Epidemiology Reference Group (FERG),enteropathogenic E. coli was one of the top three enteric disease agents responsible for most deaths globally in 2010. Enteropathogenic E. coli associates with infantile diarrhea and it is the major cause of infant mortality in developing countries. Enterotoxigenic Escherichia coli (ETEC), the most common cause of travel-associated diarrhea, can be found in less-developed countries. ETEC can also cause mortality for children under the age of 5. In Inkwanca Municipality: Integrated Development Plan 2012-2017, one of the remarks made on Molteno water supply concern was the need to upgrade the monthly raw water treatment system. Molteno raw water source is abstracted from Molteno Dam, the Jubilee Dam and a borehole in Denekruin Township. As the dams are open water sources, it may carry more of a risk for E. coli contamination than closed water sources. Precautionary measures such as restricting domestic, livestock or wild animals access to these dams should be taken. Surface water should also be in adequate distance from untreated manure and human sewage waste system. Borehole water can also be contaminated by agricultural livestocks effluent. It is important for the municipality to maintain and upgrade the raw water source treatment and purification work as recommended in the development plan. 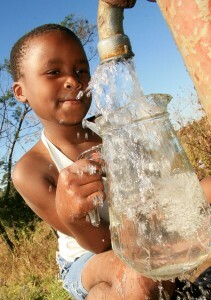 Both Ditsobotla and Abaqulusi have experienced water shortages due to the growth demand outstripping the water supply. The National Treasury advises that all municipalities should ensure that the water tariffs can cover the cost of maintenance and renewal of purification plants, water networks and water infrastructure expansion. To prevent low income households from opting for unsafe water sources due to the water tariffs, Free Basic Water Policy and water subsidies are implemented in some municipalities. To prevent reoccurrence of E. coli detection in drinking water, South African municipalities must put in a sustainable water supply budget plan in order to supply high quality potable water for households of all income levels. Hi Michelle this article connects nicely with the Escherichia Coli topic we learned in class, particularly with Enterotoxigenic Escherichia coli, which causes up to 30% mortality in infants. This specific microorganism is a major concern in developing countries, such as Africa. This article explains that raw water carry a high risk of being contaminated with E.coli since the water may have been in contact with livestock and wild animals. I agree with you that the government should create a better plan in providing a safe water source for citizens across the nation. This is a great plan, however, it is costly and will require sometime before everyone is able to receive safe water. In the meantime, I think it is important to educate the people ways to obtain safe water. For example by treating it with chlorine or boiling water to kill off pathogenic organism that maybe in raw water. Hi Katrina, I think you made a great emphasis on how E. Coli influence mortality rate in South Africa greatly. As Colleen mentioned, the use of chlorine can kill pathogenic organisms in raw water since it is a disinfectant. However, the use of chlorine can cause cancer due to the byproduct it produces. I suggest using ozonation instead since it does not produce any byproduct and it is very effective. There are several other disinfectants too which I found from a website: http://www.prominent.co.za/Applications/Disinfection.aspx. I liked your article! I believe that South African authorities should try to correct this problem as soon as possible, and try to provide potable water to the population to avoid contamination with E. coli, with can lead to very serious consequences, especially in children. As said by the other commenters, it will take some time to build a good water infrastructure capable of providing drinkable water to people, so campaigns should also be made to teach the population how to make the water potable, boiling it for example. One very important point that you wrote is the availability of free potable water to low income populations, and I’m glad to read that there are a Free Basic Water Policy and water subsidies, and I hope they are implemented in other places as well.